La fragua sin fuego / No fire for the forge. Cerrillos, N.M.: San Marcos Press, 1971. 8vo (23.5 cm, 9.25"). ff., pp. 2–66. [1 (blank)]. 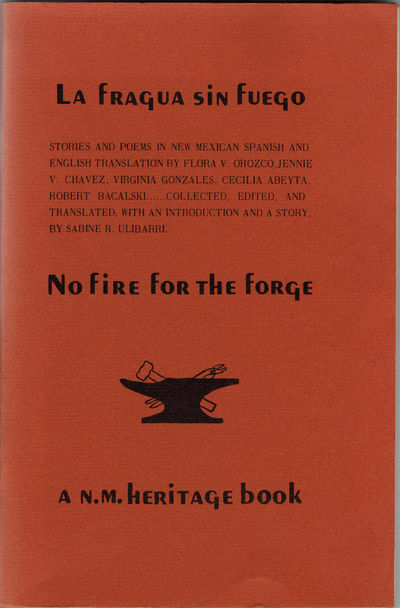 First edition of an anthology of short stories and poems by seven Chicano writers; edited and with a forward and a short story by Ulibarri. Bilingual text. The other writers in this anthology are all New Mexicans: Flora V. Orozco, Jennie V. Chavez, Viginia Gonzales, Cecilia Abeyta, and Robert Bacalski.